From last two three days, I was noticing this question, circulating over Quora. So I decided to shed some light there. This confusion is only due to resemblance of names. Nefertiti and Nefertari were different individuals that lived approximately 50 years apart. The Chief Royal Wife of Akhenaten‘s full name was Nefer-neferuaten Nefertiti, which means Beauty, or beautiful of Aten, The beautiful one, lived in the 18th Dynasty sometime between 1394 b.c. and 1340 b.c. Nefertiti is also known for a famous bust of her head, as show below. The Chief Royal Wife of Ramses II‘s full name was Nefertari-Meri-Mut which means, The most beautiful of all the land, Beloved of Mut, and lived sometime between 1292 b.c. and 1225 b.c.. Again these dates will vary. Nefertari had a temple built for her at Abu Simbel. All four great statues at the entrance of this temple are of Ramses II, while Next to the legs of the colossi, there are other statues no higher than the knees of the pharaoh. These depict queen Nefertari. This entry was posted in Saunterer Soul and tagged Abu Simbel., Akhenaten', Bust, Mut, Nefertari, Nefertiti, Ramses II. For me, this is really a controversial piece of hieroglyph in the temple of Abydos. Some people (who claim that Egyptians had some contact with aliens) believe that this hieroglyph is real and in original form. Some other says that the carving was altered by the successors of Ramses II (may be Merneptah). It was a common practice among Pharaohs of Egypt to destroy the symbols and glory of their forefathers, in order to showcase themselves. Example is Hatshepsut’s temple at Deir el Bahri, where statues and wall paintings were destroyed by her own son. 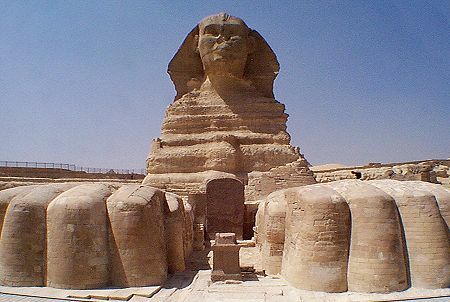 This entry was posted in Saunterer Soul and tagged Ancient Egypt, Deir el Bahri, Hatshepsut, Merneptah, Pharaohs of Egypt, Ramses II, Seti-I, temple of Abydos.. The Giza Plateau has three main pyramids. The pyramid of Menkaure, the pyramid of Khafre and the great pyramid of Khufu. As per the today’s widely accepted assumptions, the pyramid of Menkaure was probably completed in the 26th century BC. Pyramid of Khafre was built during the reign of Khafre who ruled from 2558 to 2532 BC. The great pyramid of Khufu was built during 2580-2560 BC. This entry was posted in Saunterer Soul and tagged Ancient Egypt, BBC documentary, Giza, Khafre, Khufu, Menkaure, Milky way galaxy, Orion correlation theory, Osiris, pyramid, Robert Bauval, Zahi Hawas. Team is crossing Hopper Glacier. This entry was posted in Saunterer Soul and tagged Baricho-kor, Hooper Valley, Hopper Glacier, Hunza, Marlas field, Nagar valley, Pharpo glacier, Rush lake, Sishkeen Hill, Tagerfari pass. This entry was posted in Saunterer Soul and tagged Aliabad, Azad Kashmir, Baltit, Besham, Chilas, Day 2 - Innocent Smiles :: Trek to Rush Lake, Gilgit, Hooper Inn hotel, Hoper, Hunza District, Hunza Valley, Kail Valley, Karimabad, Lady finger, Nagar valley, Nangaparbat, Northern Areas., Rakaposhi, Shalter Peak, Trek to Rush Lake, Ulter, Ulter2.